Some runners get terrible intestinal distress when they eat beans (and likely some other foods as well. Think onions, garlic, and wheat). The poorly digested fiber/carbohydrate in these foods become a feast for gut bacteria. When microbes eat these undigested carbs, they create gas bombs. In some people, this fiber causes diarrhea too. Not fun. If you fall into this category of avid bean avoiders and want to learn more, you may want to read The Complete Idiot's Guide to IBS by Kate Scarlata, RD (www.katescarlata.com). Remember this jingle: “Beans, beans, the musical fruit. The more you eat, the more you toot”? The embarrassment associated with tooting explains why many runners shy away from beans (pinto, kidney, black) and also legumes (lentils, peanuts, soy, chick peas). But far more than being a musical fruit, beans can be a nutrient-rich bonus for a sports diet. 3) they contain phytates that can diminish the absorption of certain nutrients (insignificant in US diets where beans are not the primary food). In this era of over-abundant processed foods, I contend that eating cooked beans enhances intake of a variety of important vitamins and minerals for runners. But before I offer reasons why you should include beans in your sports diet, here are tips to minimize the “toots” so you’ll want to even entertain this suggestion. 2. Drain the liquid from canned beans and rinse them well. This will decrease the amount of gas-producing carbs. 3. Try Beano, a product with the digestive enzyme that breaks down raffinose; it may help some people. Beans are a positive addition to a sports diet. Here’s why. 1. Beans are a natural protein-carbohydrate combination. As a runner, you need carbs to fuel your muscles and protein to build and repair your muscles. A bean burrito, hummus wrap, or bowl of chili is a great way to fuel-up or refuel from a hard workout (if you don’t get gas propelled, that is). 2. Beans are a good source of plant proteinbut take note: you do need to consume generous portions of beans if you are a vegetarian. Runners need at least 10 grams of protein per meal to trigger muscular growth, and most athletes need at least 60 to 90 grams of protein per day. Half a can of refried beans offers only 10 to 12 grams of protein, the amount of protein in 1.5 eggs or a few bites of chicken. One spoonful (1/4 cup) of garbanzos on a salad offers only three grams of protein. 3. Beans have a low glycemic index, which means they are slow to digest and offer sustained energy. Low GI foods are good choices before long endurance runs if you cannot eat anything during the workout. 4. Beans are rich in vitamins and minerals, such as folate, manganese, potassium, iron, copper and magnesium. All these “spark plugs” help your body’s engine run smoothly. 5. Beans are good for heart-health. (Remember this jingle: “Beans, beans are good for your heart. The more you eat, the more you ___.”?) Yes, the soluble fiber in beans helps protect against heart disease by lowering the cholesterol in your blood. Also, beans are naturally low in fat and dietary cholesterol, so replacing meats with beans is a heart-healthy swap. 6. Beans are high in fiber (7 to 8 grams fiber per half-cup). This sharply contrasts to the chicken or meat they replace that has no fiber. This fiber acts as a “broom” and assists with regular bowel movements. Snacking on hummus with baby carrots contributes 8 to 10 grams of fiber towards the recommended daily target of 25 to 35 g.
7. Beans are inexpensive. By enjoying bean-based meals such as chili or lentil soup, you are likely eating less animal protein and saving a lot of money. 8. Bean-based meals are better for the environment than meat-based meals. If everyone were to eat one less meat-meal a week, we'd need fewer beef cattle (major producers of greenhouse gasses) and this could assist in the war against global warming. 9. Beans are good sources of fuel for the harmless, health promoting bacteria that live in your gut. We each have about 2 to 4 pounds of gut bacteria that strongly influence our immune system. In fact, about 70% of our immune response is generated from the gut. The bacteria love to eat the undigested raffinose provided by beans (and other vegetables such as broccoli, cauliflower, cabbage, brussel sprouts, and asparagus). Having well-nourished gut microbes invests in overall good health. A strong intake of prebiotics (bacteria food) helps strengthen the immune system and optimizes wellness. In contrast, antibiotics kill the good bacteria along with the bad bacteria. 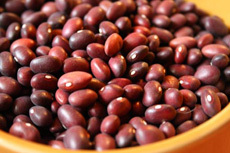 Here are a few ways to easily add more beans and legumes to your sports diet. • Hummus -- A tasty dip with carrot sticks, or an alternative to mayonnaise on a turkey sandwich. • Refried beans -- canned vegetarian refried beans are fat-free. Heat some beans in a microwave oven, spread them on a tortilla, spoon on some cottage cheese and salsa, and then wrap it up like a burrito. Voila: a tasty breakfast, lunch, snack or dinner that fits into a meager food budget. • Chili with beans -- make a potful and enjoy planned-overs for lunch or dinner that week. • Salads -- spoon on black, white, or red beans and you’ll have a super sports salad that offers carbs to fuel and protein to build muscles. • Soups -- minestrone, lentil, black bean, and split pea soups make hearty, wholesome meals, You can also add beans to almost any soup to add substance and nutrients. • Baked beans  served on toast (a popular breakfast item in England). A small can of baked beans can also be a filling snack. • Pasta -- toss a can of pinto or white beans into spaghetti sauce. Serve over pasta shells (they “catch” the beans). Nancy Clark, MS, RD CSSD (Board Certified Specialist in Sports Dietetics) counsels active people at her private practice in Newton, MA (617-795-1875). For more information, read her Sports Nutrition Guidebook and food guides for marathoners, soccer players, and cyclists. They are available at www.nancyclarkrd.com. Also see www.sportsnutritionworkshop.com for online CEUs.